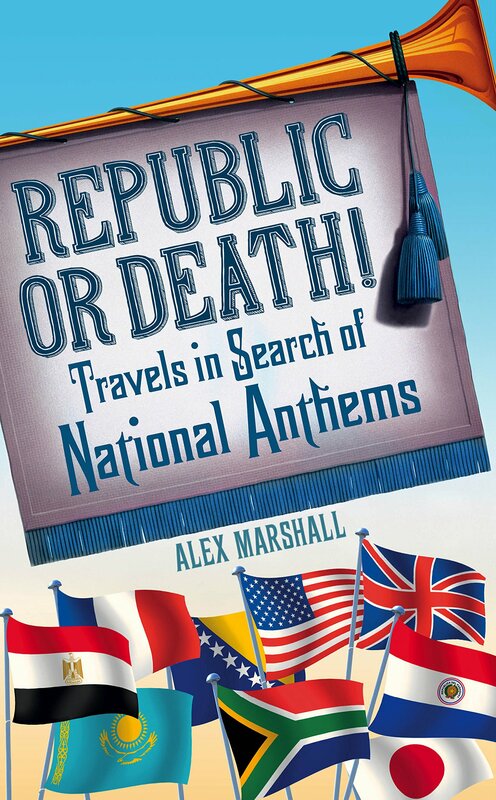 My book – an “endlessly enthralling” part-history, part-travelogue about national anthems – came out last August on Random House, but since it’s just emerged in paperback, I thought someone might appreciate this guide of what to do after your book appears. Because I’d have really liked it when mine did! Random House did an amazing job of getting my book into Waterstones, the UK’s largest book chain, but I quickly discovered it wasn’t in many independents – the stores I buy books from. And to me, that meant it was like it didn’t exist. It was only because I replied, “No,” and “Yes”, that they agreed to take the book’s name. But other occasions were, frankly, brilliant. The Stoke Newington Bookshop in north London already stocked it and almost instantly booked me for their festival. While Newham Bookshop in east London ordered some and arranged a talk based partly, it seemed, on the fact I “looked alright”. I dread to think how hard it’d be cycling around shops if you’re a fiction author – “Can I tell you about my book? It’s a modern retelling of Jonah and the Whale”. I also dread to think what it’d be like if you’re self-published. But I would still recommend doing it above anything else. Oh, I took a CD of brilliant anthem covers with me to give to shops in an effort to guilt them into stocking the book. I wouldn’t recommend doing that, though. It turns out most shops, like most people, don’t play CDs anymore. Of all the things I’ve done, events have been the most successful in getting the book ‘out there’. I would recommend doing as many events as you can, but contact people early. And I mean E A R L Y. Like yesterday. I didn’t realise that book festivals book a long time in advance – literally six months, a year in some cases. Most of the ones I contacted loved the idea of me doing a talk, but had already filled all their slots, which was, again, quite dispiriting. Your publisher may actually arrange events for you, but mine largely left me to it and it took me too long to realise I needed to act fast. Be creative too: schools, your local library, universities – all may like you to come in, especially if you’re writing non-fiction. I write that not having done any talks at schools or libraries, but I’m sure it’s true. I’ve written some utter rubbish in books I’ve signed – “I hope this gets you singing!” being perhaps the worse. Make sure you don’t write anything as bad. I honestly haven’t got the faintest idea what the best form of press is. I’ve written articles about anthems, listicles, I’ve been on TV talking about them, I’ve popped up on radio shows and done podcasts. I haven’t checked how many copies my book’s sold after each bit. That might be a mistake as it’d be good to realise what works and what doesn’t, but I long ago decided I didn’t want to know how many copies my book had sold (it’s not good for your mental health, especially after your agent tells you a good non-fiction sells a paltry 1,500 in the UK and not to expect any more). I admit I might have found it easier getting press than others do. I’m a journalist so am used to pitching to editors (and dealing with the rejection). I also have a very helpful PR person, and I a topic that’s regularly in the news. But do keep plugging away no matter how many editors ignore your calls. When you are doing press, though, keep in mind it’s always impossible to get across what your book is. Some articles I’ve written have made my book seem like a wacky fact book (it isn’t); others have made it seem like a deathly serious analysis of nationalism (it isn’t). Also, don’t be ripped off. If someone’s asking you to write something that requires original research, ask to be paid. If someone’s asking you to go into a radio studio, always ask for an appearance fee. You may not get any money, but you’ll feel better for asking. Where have I drawn the line? To be honest, I haven’t turned down much. It’s only really been from US publications who’ve asked me to do work on the basis it’ll be “good exposure”. My book isn’t out in the US and spending several hours on a piece for a one-sentence quote hasn’t seemed like a good use of my time when I could be writing blogs like this instead! The first few weeks after my book came out were such a panic I didn’t do one thing: enjoy the moment. I had a book out! I’d worked on it for years, I was proud of it, and now people were reading it. Some were even enjoying it. That is utterly amazing. For all the slog of cycling around every book shop in London, it’s worth it, I promise. I get asked, bizarrely frequently, how to get a book published. Bizarrely because I’m not J K Rowling; I’m someone who’s written a book on national anthems. But if I can help, I will, so how did I get a deal? If I’m being honest, one of the key moments was when an agent approached me after seeing an awful article I’d written for the BBC which dodgily claimed I was writing a book on these songs (I hadn’t written a word; I was more marking territory). They gave me some guidelines explaining how to write a proposal and asked me to get in touch when I’d finished it. Why are you the person to write it? Who is your audience and why will they buy it? A biography to explain who on earth you are and prove that you can sell the book once it’s out. Have you done any public speaking or radio, for instance? I didn’t actually go with that agent – they simply weren’t right for me – but I did follow their guidelines to the letter, wrote the proposal and a sample chapter and sent them off to another who I knew had dealt with similar books. He loved the idea, fortunately, but told me it was so bizarre (part-travel, part-history) – and me so unknown – that I needed to write two more chapters before he’d consider taking it on. That took me ages (I was fitting research into holidays, and writing late at night), but it worked out. How important was the proposal? Vital. No agent would have taken me on without it. But it was also just personally helpful, as it made me work out exactly what I wanted to do and think about such topics as who my audience was which ultimately improved the writing. It was a lot of work (5,485 words, 19 pages), but I wouldn’t hesitate doing it again. Although saying that, the chapters were what actually got me the deal, especially one on Nepal’s national anthem, through which showed I could take the story of a minute-long song and make it have broad relevance. And that chapter was funny. That really helped. Buy my book if you want to read that and wonder why on earth a publisher liked it! I’ve heard of people securing agents and deals without a proposal just an idea – and obviously you don’t have to get an agent or publisher at all these days – but if you think it’d help you, I really suggest giving it a go. Apologies to any regular readers for posting something that wasn’t about national anthems. But so many people helped me with my book, I thought I’d try and help a little back. Over the next few days, I’ll do a couple of other posts featuring advice I wish I’d had when I published. Feel free to share/bear with me [delete as appropriate]. It’s basically the same as the hardback except it’s had the mistakes removed (especially the bit where I said someone was dead when they actually were very much alive – whoops!). The French chapter’s also changed a lot to reflect everyone in Paris singing la Marseillaise following the terror attacks in Paris. Never write a book about a moving subject. Basically, it’s better all round, although I admit it is less good for hitting people with or for killing spiders. You can buy it here, but if you’d prefer getting it for free, my publisher’s giving away 20 copies over at Goodreads (COMPETITION CLOSED SORRY) where you can also marvel at its 4.21/5 rating and such reviews as “Who knew national anthems could be so fascinating?” and “I enjoyed this book a lot more than I imagined I would from the title.” Good luck!